In the novice competition, judges named Philip Buchanan, Gleno Valley YFC as the YFCU sheep shearing novice winner for 2018 and he received the John Gilpin trophy. 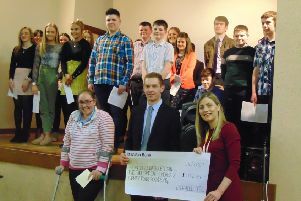 Second place went to Stephen Wilson, Gleno Valley YFC and third place went to Matthew Robinson, Gleno Valley YFC. Second place went to Sean McCollum, The Glens YFC and third place went to Chris Coulter, Straid YFC. Stephen Morgan, Spa YFC was also awarded a prize for the quality of the sheep shorn in his pen.